Are "Aliens" some of the Fallen Angels? Some people, including myself, believe that aliens are some of the fallen angels. Senior bibliographer from the Library of Congress, Miss Lynn E. Catoe wrote the government document, UFOs AND RELATED SUBJECTS: An Annotated Bibliography, and summarizes her findings. She wrote, "A large part of the available UFO literature is closely linked with mysticism and the metaphysical. It deals with subjects like mental telepathy, automatic writing and invisible entities as well as phenomenon like poltergeist manifestation and possession. Many of the UFO reports now being published in the popular press recount alleged incidents that are strikingly similar to demonic possession and psychic phenomena that have long been known to theologians and parapsychologists." Mathew 7:16. You will know them by their fruits. Do men gather grapes from thorn bushes or figs from thistles? Will aliens be part of Armageddon...the end of times? 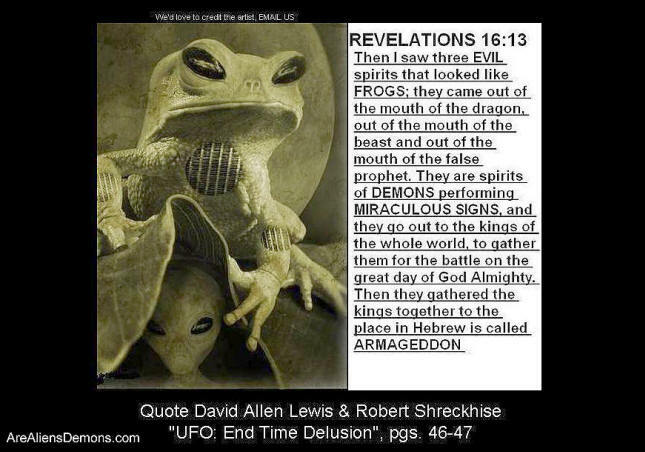 Notice the resemblance between the frog and the alien. There are no fallen Angels. This are only beliefs and ideas of our ancestors. According to history, most children didn't go to school back then. And that's simply becaus their parents couldn't afford it. You only have to put yourself in their shoes, to imagine this kind of life. You would believe anything, because you've got no sense of logic and you can't even read! I'm not even talking about the meanings of the words itself. There were many people who didn't know the exact meaning what this and that word really means. But they used them anyway! And an "Angel" can be anyone! You only have to define the true meaning of the word Angel. And that's simply somebody is there in need. But people make the mistake and confuse a simple "good luck" with powerful beings who can fly and are powerful like the right hand of a god! Maybe you should use your own brain for once! Try to solve the mystery yourself! What makes you think the people back then were smarter than you? When a soul frees itself from reincarnation and earth, you could call that soul "risen". There are a number of degrees, levels of souls who are risen. If you meet a soul which is significantly risen, you might call this being, this soul an "angel". Sometimes a soul which has freed itself throws it away, either by "accident" or by choice. It is then called that this soul, this being has fallen. When fallen, they have to lift themselves up again, do it over again. Some do this by choice, to learn more. Some beings known in ancient writings are real beings. I am not necessarily saying all are, but some are. There are some such beings who are fallen. Meaning they are reincarnating and living as any person. Where a soul was and where a soul is, are not the same thing. A soul that was risen, perhaps known in ancient writings as an "angel", and a soul that has never been risen, are both equally human. Neither is any more an angel than the other. Both can rise and reach the same level, the same freedom. People are more aware in these days about the vastness of the universe, other planets, potential for life on them etc. The reality of other dimensions, what is after death, nature of soul etc is less known. Many might try to ignore the higher dimensional parts and only look "outwards" as in the physical universe. You would need to be aware of both. There might be references here and there in history of beings from other planets, I do not know. However there are a lot of references to higher dimensional realities. The higher dimensional part play a very major role to the souls relation and existence on earth. There has been many people through history who has seen and learned about this. Weither there has been aliens landing on earth in past, which has been documented in different ways, I do not know. But you cannot try and fit everything into it. By what evidence? Who said we have a soul? Great answers! I'm a broken record because I think everyone else has given amazing replies. All in all, I agree? I think? If angels means higher beings outside of Earth's origins then yes. I like reading books to learn. It's like you have to learn to UNLEARN. If that makes sense. Words, writing, reading, experience. And most important, projecting ourselves/emotions onto things and others. Do we know the answer? Yes. I think we are getting there. There are other forms of 'life'/living that we just currently can't comprehend. Another dimension where time doesn't matter? Angelic/higher beings/aliens that are literally made of light? What is our subconcious? Demons/angels, yin/yang, positive/negative they exist together. If we ever come up with 'proof' one exists, shouldn't the other? I think there are many higher beings that help us in the right direction and whether you call them angels, your higher self, positive aliens/pleiadians, I'm sure in some way you're right. It is just words and labels after all. :) There are so many many many theories stories and experiences that are shared it's hard to deny a correlation between angels/aliens if you get real deep in it. Buutttttt as for physical 3rd dimensional so real you can touch aliens calling them angels here in Earth? Hard to answer that one without getting deep into a conspiracy rabbithole.